YouTube is a video-sharing website on which users can upload, share, and view videos. As one of the most popular video sharing website, YouTube grants thousands of, perhaps millions of users to upload, share and video videos, and of course registered users are also be allowed to download their favorite videos. Maybe some people prefer enjoy YouTube videos on TV system. So they need to burn YouTube videos to DVD or Blu-ray disc. But how to burn the funning YouTube videos to DVD or blu-ray disc? Here our programs can help you burn your desired YouTube videos to DVD. Any Video Converter and Any DVD Converter Professional feature a new characteristic: both of them can burn YouTube video to DVD with DVD Menu. Here the following is a brief guide on how to burn YouTube video to DVD/Blu-ray disc. Step 1 : Add/Download YouTube video to the program. If you have downloaded the YouTube videos from the website and saved in your computer disc, you just need click Add Video button or go to menu File > Add Video Files to select your desired video clips from your hard drive. But if you do not download the YouTube videos, with Any Video/DVD Converter, you can download videos from Internet and then burn it to Blu-ray disc. Firstly, you need click Online Video tab in the Options window to sign in your YouTube account. 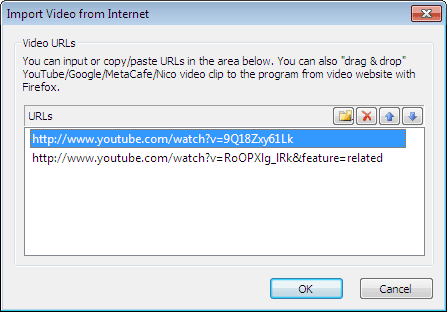 Then visit YouTube.com and right-click on the desired video to choose Copy Link Location (this is for Firefox users) or open the video and then copy the URL from the navigation bar (this is for IE users). Secondly, you can click online video download button to begin download YouTube directly. 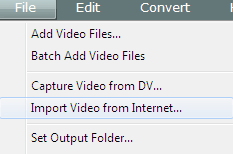 Or you can choose File> Import Video to from Internet to begin downloading videos. After you have downloaded the YouTube videos, all of them will be displayed on the middle panel with their detailed information, including duration, format and size, etc. Please unfold Output Profile, choose Burning to DVD from the list, and then choose DVD video NTSC Movie or DVD video PAL Movie according to your TV system. Step 3 : Click Convert button to start encoding YouTube videos. Once everything is ready, you can click on Convert to start the exporting process. If you would like to cancel encoding, please just click the Stop button and click Yes in the pop-up window then the encoding will be stopped. Step 4 : Choose DVD Menu. You will be prompted to choose DVD Menu when the program finishes YouTube video conversion process. --In DVD Menu Tile, you can name your DVD and input it into the box directly. --In Background Music, you can browse music file from your local computer for your DVD. --In Background Image, you can change your DVD's background image by click Browse Image File to select your desired image from your computer. --In Menu Navigator, you can choose the playback mode for your DVD. After you have made sure the settings, please click Next>> to follow the next step. 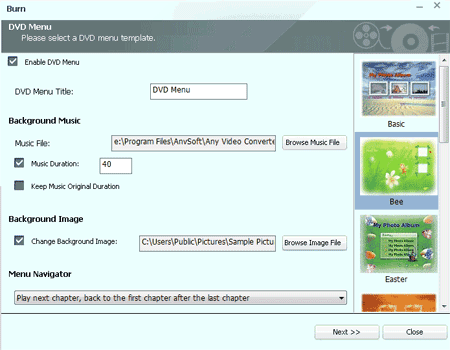 Insert a DVD media to the DVD burner, select recorder from the drop-down list, enter your desired Disc Label, and then click Burn button, then the program will begin to burn video to DVD. 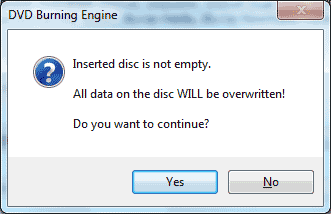 After the program finish to burn YouTube video to DVD, it will pop up a DVD Burning Engine to congratulate you that your disc has been successfully burned. Now your YouTube video have been burned successfully to DVD/Blu-ray disc, just have fun!